Welcome to The Cover Contessa's stop on the Mindwar blog tour! We welcome Andrew today for a guest post! Take it away! A lot of times I hear readers — and even some writers — say that bad guys are more interesting than good guys. I disagree. I think bad guys only seem more interesting sometimes because writers don’t tell the truth about the good guys. That is, they write the bad guys with all of their flaws showing, but they write the good guys as if they were good all the way down, as if they had no bad inside them. That’s not only boring, it’s also totally unrealistic. There’s an old expression: “Don’t compare your inside with another person’s outside.” In other words, don’t look at someone else’s good actions and compare them to your bad thoughts. Because we all have bad thoughts. The greatest hero in the world is a hero because he or she triumphed over his bad thoughts to do the right thing. He triumphed over his cowardice, his smallness, his envy, his greed and his pettiness — he triumphed over them, but that doesn’t mean he didn’t experience them. He did. Unless he’s an android or an alien or something, believe me, he did. So I try my best to write good guys who are recognizable inside and out. That is, my good guys and girls aren’t brave because they feel no fear, they’re brave because they triumph over their fear. They’re not generous because they sparkle inside like a dish in a dish soap commercial. They’re generous because when they felt the desire to be greedy, they fought it down. In MindWar, Rick Dial is a troubled guy, a passionate hot headed macho man who’s so angry at the bad things that have happened to him that he has a hard time rising above it. Personally, I think he’s at least as interesting as the bad guy. Personally, I think he’s more interesting. Thanks so much for stopping by today, Andrew! It's been great having you here! 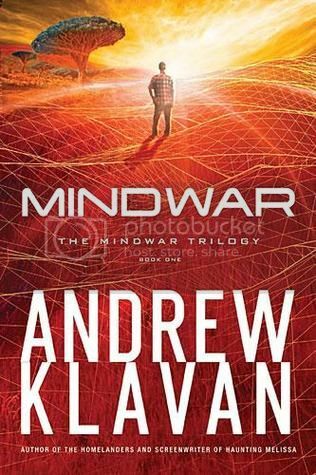 This book mindwar seems very intense and hear warming, I would like to read it.